These condolence letters received by Huey Long's widow offer a rare glimpse into the impact of Huey's life and death on Americans from all walks of life. 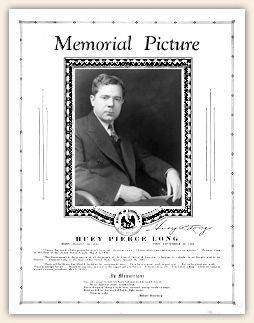 Rose Long and her children received thousands of heartfelt expressions of sympathy, all with a common refrain: Huey Long was my friend. Below is a representative sample of these letters, which were only recently discovered among the personal effects of Mrs. Long. — signed "Ada Cambridge Frison (Colored)"
II do not wish to intrude at this time upon your grief. But as I listened to all broadcast concerning our beloved Senator from the time that the cowardly bullet was fired until the end, it seemed as though everyone from all walks of life were sending telegrams expressing their sympathy. I felt that in some way somehow, I would like to let you know that the school children grieve with you, at the passing of a wonderful friend. He is gone may God bless him. His life came to an untimely end. And pray for a wonderful friend. In this hour of your great sorrow, may your loss be humanity's gain. This terrible tragedy is but the repetition of history. Every great soul who has fought for the rights of mankind have [sic] unfortunately had to pay the penalty with his life. Socrates was forced to drink the poison cup because he taught the people truth. Jesus of Nazareth was crucified because he drove the money changers from the Temple. Abraham Lincoln gave his life for the emancipation of a race. Eugene Debs suffered martyrdom at the hands of the enemies of the people. Secretary of Share Our Wealth Societies of Jones, County, Miss. Inever thought the occasion would occur that I could sincerely regret anything that could happen to a Southerner. My Uncle lies buried near Andersonville Co. H. 9th Michigan, died of starvation. My people have damned the South and all its works since. But among any people there arises in time of crisis men such as yourself. Like Abe Lincoln, with no axe to grind, a man who is of the people and for the people every waking moment of his existence. As such a man and American citizen I wish to offer you my deepest gratitude for what you have done for the common people and I know that time in your home state will be reckoned B.H.L and A.H.L for decades to come. I hope to hear of your early recovery and wish you a long life, that I know will do a great deal for the rest of the states as your past has for your own. Iam probably one among thousands to give you my sympathy — remembering the tragic and untimely death of your husband. If the word of a complete stranger can be at all consoling, let me assure you that the death of Mr. Long is a great loss to the whole nation. In the death of Huey Long, it is like the passing of a relative — or a friend who has fought an untiring fight for the rights of all. Although none of us in this neighborhood has ever seen Mr. Long, personally, we have heard him over the radio many times — and we have read his speeches. He was a familiar figure whom we followed and upheld — and had he run for president of the United States, he would have had our votes. My dear Mrs. Long, we are grieving with you. There can never be a substitute — never another leader so unique as Mr. Long. He had a forceful personality, a restless ambition, a ceaseless unselfish urge that drove him into battles for the justice of the American people. His enemies were only among the evil, moneyed powers who still hold the fate of the nation in their grip — and it was they who really struck the cowardly blow causing Mr. Long's death.